The Marimba Workshop is owned by Ian Lithgow and has been in existence since 2004. The marimbas were originally crafted by hand by Ian, who is a meticulous woodworker. Ian’s attention to detail makes his marimbas not only excellent-sounding instruments but also beautiful works of art. He now has a factory manufacturing his instruments under his watchful eye. He is always on the lookout for constant innovations to improve his marimbas. Ian has not always worked as a craftsman. 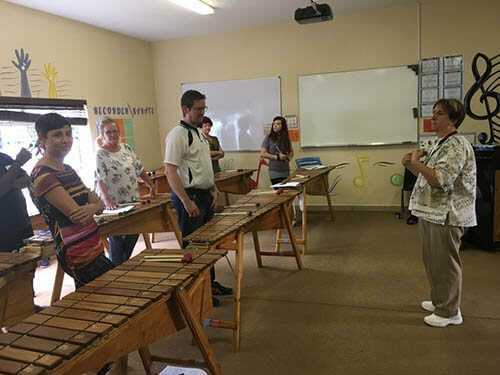 His extensive experience as a sales executive in various industries not to mention education, guarantees that YOU, the client, will ALWAYS get outstanding service and excellent after-sales service, for which The Marimba Workshop is renowned! His wife, Joan works for him as his Workshop Facilitator. 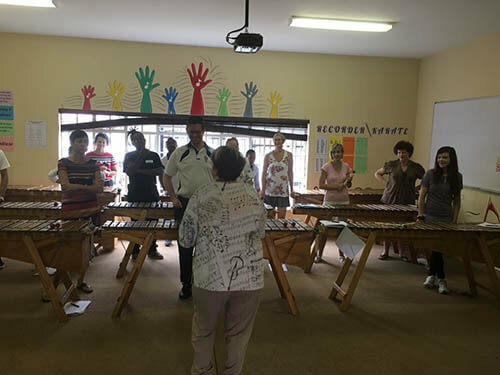 Her impressive music qualifications in music education, African languages and ethnomusicology, together with over 30 years of teaching experience with more than 20 of them teaching marimbas in the classroom, makes for fun-filled marimba workshops. She published her first marimba book entitled: MARIMBA MAGIC: 9 TRADITIONAL AFRICAN SONGS ARRANGED FOR CLASSROOM MARIMBAS early in 2006 and her second marimba book entitled: MARIMBA MAGIC: BOOK 2: A SELECTION OF SOUTH AFRICAN FOLK SONGS AND ORIGINAL MUSIC ARRANGED FOR CLASSROOM MARIMBAS in 2008. Joan is the co-author of a pre-school marimba programme entitled: MARIMBA WORX FOR KIDZ launched in 2009. This is a pre-school Arts and Culture Programme that draws upon music, drama, movement, fantasy play and story-telling to engage young children in the very important learning area of Arts and Culture using the marimba as the instrument of instruction. Her third marimba book entitled MARIMBA MAGIC: BOOK 3: A SELECTION OF CHRISTIAN SONGS SUITABLE FOR ASSEMBLIES ARRANGED FOR EASY CLASSROOM MARIMBAS was published in 2013. Her latest book: 33 MARIMBA ARRANGEMENTS CELEBRATING SOUTH AFRICA’S 11 OFFICIAL LANGUAGES was published in 2014. Joan was one of the Founding Directors of The Marimba Education Foundation and was the organizer of 6 highly successful National Marimba Festivals. She has since moved on and joined Education Africa to further her passion for, and aims and objectives with marimbas not only on a local scale, in particular with rural communities, but also on an International scale. 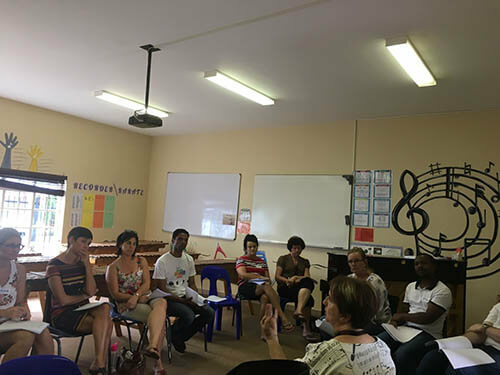 Concurrently while working at The Marimba Education Foundation Joan was also the music teacher at St. Dominic’s School in Boksburg. Joan is the organizer of the EDUCATION AFRICA INTERNATIONAL MARIMBA AND STEELPAN FESTIVAL and has completed 5 festivals to date. This festival is regarded as the LARGEST FESTIVAL OF ITS KIND IN THE WORLD with just on 2000 participants taking part in 2016. Joan has taken nine amazing trips with marimba bands in 2010/2011/2012/2013/2015/2016 under the auspices of Education Africa. She had the privilege of arranging Beethoven’s Ode to Joy theme for marimbas for a performance in Vienna, Austria for a combined United Children’s orchestra and full professional orchestra and choir for a live televised event: Life Ball. She also had the honour of arranging Gloria Gaynor’s smash hit: “I will survive” for Marimba Band having the diva, herself, perform with the Stoneridge Marimba band from Eden Park which she co-trained. This she did for a fund-raiser at the Loeb Restaurant in Central Park, New York. 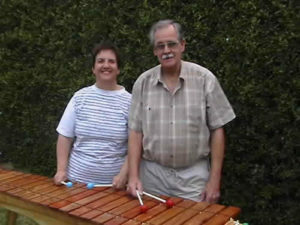 In 2011 she accompanied the Stoneridge Marimba band to Vienna, Austria on a performance tour. In 2012 she accompanied the Aqua Vista Marimba Band from East London on a tour to Vienna and Slovenia where the band took part in the famous Lent Festival in Maribor and in 2013 she once again accompanied this band to New York where they shared the stage with Roberta Flack. In October 2013 she took the John Wesley Community Centre Marimba Band which she co-taught with Mpumi Madingoane to the UK where they performed in West Sussex at the beautiful Windlesham School as well as the famous Shaka Zulu Restaurant in London. In 2015 she once again took the John Wesley Community Centre Marimba Band to the UK where they performed at Lambrook School in Berkshire as well as a number of venues in London. In 2016 she once again took the Goede Hoop Marimba Band from Reiger Park in Boksburg to Lambrook School and then to London where they performed at The destination restaurant: Shaka Zulu. A 3-part CNN documentary for the INSIDE AFRICA programme on the EDUCATION AFRICA marimba hubs project working with deaf children in Hammanskraal. There is a performance featuring the marimba bands from the Dominican School For The Deaf in Hammanskraal and Goede Hoop in Reiger Park accompanying LADYSMITH BLACK MAMBAZO singing “HOMELESS”. This programme was in 3 parts.